Discover Europe and cruise the Caribbean in style on Norwegian Getaway. Combining top destinations with luxurious amenities, a cruise on Norwegian Getaway makes for a memorable family vacation. Choose from more than 28 restaurants, enjoy five thrilling water slides, or simply stroll along the quarter-mile-long Waterfront, where restaurants, beach bars, and night spots vie for your attention. Norwegian Cruise Line's dedicated onboard team makes sure you’ll be free to relax. Catch the dazzling, Broadway-inspired Burn the Floor, and let the performers teach you their dance moves. You’ll find a family-friendly interactive carnival and a steampunk circus on board, as well as comedy, live music, and even a wine lovers’ musical performance. Kids and adults alike will love the thrilling aqua park, and with a spa, gym, salt room, thermal spa, and sports complex, you won’t want to disembark. 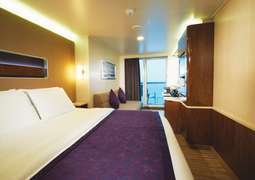 Norwegian Getaway offers a wide range of staterooms. 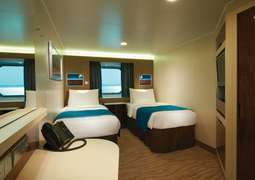 There are studios for solo travelers, as well as indoor and oceanview staterooms, most of which are furnished with two single beds that convert to a queen-sized double. 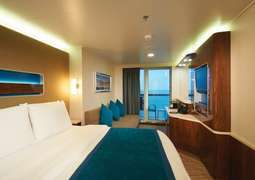 The family rooms in indoor and oceanview staterooms also come with a sofa bed that sleeps two. For splendid ocean views, choose from a selection of balcony staterooms, or treat yourself to a spa suite, which offers easy access to the spa and complimentary use of the thermal suites. While mini-suites give that extra touch of luxury, for true opulence, opt for a haven stateroom tucked away at the top of the ship – the most prestigious way to sail. The ship's three main dining rooms offer delicious meals, with complimentary buffets being served in the Garden Café. You’ll find fusion flavors at Savor, a fantastic range of dishes at Taste, Irish pub fare at O’Sheehan’s, and authentic Chinese noodles at Shanghai’s – Norwegian Getaway houses plenty of specialty restaurants offering fresh dishes inspired by countries worldwide. Kids aged 3 to 12 will love hanging out at Splash Academy, where the youth program will keep them entertained all day. Teens up to 17 have their own hangout spot, Entourage, leaving you time to relax by the pool or pamper yourself at the Mandara Spa and Salon. When night falls, the ship comes to life, with live performances, cozy restaurants, and chic cocktail lounges. Norwegian Getaway's dress code is mostly cruise casual, except for select events and areas. Following Norwegian Cruise Line's Freestyle Cruising model, guests are encouraged to dress comfortably. However, for guests who like to dress up occasionally, there is often one optional event with a formal dress code.